... from cables (known as mechanical). My Giant Escape Disc is now equipped with Teppan Yaki SP5 floating stainless steel rotors and Shimano Deore M596 hydraulic brakes (opposed 2-piston design) with sintered pads. 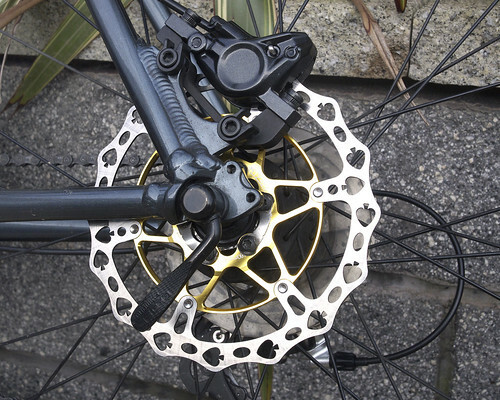 These brakes are 'bottom end' MTB (this bike is actually a hybrid) but according to Singletrack Magazine have "gained some of the features only seen on the top-end group (Servo-Wave braking) and feature an excellent modulation and easy maintenance due to Shimano's one way bleeding system." Incidentally, I see the 2011 Escape disc, which mine is, is described as having a carbon composite fork. I'm sure it was steel when I bought it last year. Anyway that doesn't matter as I had a suspension fork from the start. It also came with cable disc brakes which I found surprisingly useless (although better than cantis). The cable brakes were spongy and noisy and frequently required new pads at a cost of around £30 per set front and back. The hydraulic system is superb in comparison to the cables. I tend to cycle in hilly terrain and the brakes matter. 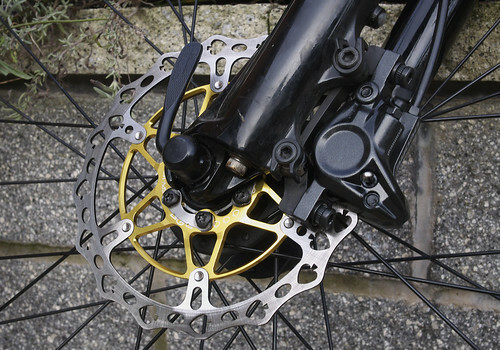 Mountain bikers know all about disc brakes now of course. When I went mountain biking in the 1990s hydraulics were not as common as they are now – mine had V-brakes: quite effective but they wear out your rims. Unless you are cycling on clean roads in fairly flat country, discs seem to make much more sense. I also like how you barely need to squeeze the lever. I will never buy another bike that does not have hydraulic disc brakes. One of my local bike shops doesn't sell MTBs because he doesn't fancy messing with hydraulics. He is an experienced mechanic and builds excellent wheels but it seems to me he's behind the times. The LBS where I got these new brakes reckon they are easy to bleed. I'll see if they're right in a couple of years – hopefully not before then. The Teppan Yaki stainless steel rotors are more upmarket than the brakes. They are pretty light, and pretty. My hybrid bike is also becoming lighter and prettier. I'll be building new wheels for it next, but not quite yet. Posted by Patrick on November 24th, 2011. The heart shape on the rotors is very sweet. I've never understood the difference (or advantage) of hydraulics over cables. Any clues, Patrick? We got disc brakes on Lady CoMo and they have phenomenal stopping power. Kern wrote: The heart shape on the rotors is very sweet. I'm no card sharp, but I reckon those are spades, as in ace of spades. Pretty, though. I really must replace the pads on my MTB's disc brakes. But even in their squeaky form they stop pretty well. Patrick wrote: I will never buy another bike that does not have hydraulic disc brakes. I wonder if the next bike in the Taylor household is going to be one of the new breed of cyclocross bikes now that disc brakes have been officially allowed by the UCI. I have to admit the word 'hydraulic' puts me off! A cable pulling pads against a rim I can understand, hydraulics are a complete mystery to me! I do appreciate they work well though. I have to admit I do quite fancy one of those myself except I can't afford it, have nowhere to keep it and Don't Need It! Kern wrote: ... the difference (or advantage) of hydraulics over cables. Any clues, Patrick? The immediately noticeable advantage is the sensitivity of the brake levers. It is like the feel of power assisted brakes on a car. With cable brakes – both disc or rim type – there is the friction of the cable and also a torque factor in the mechanical parts that deliver force to the brake surface. It is more direct on a hydraulic system. A hydraulic brake also has improved modulation – the ability to apply variable amounts of braking power without locking the wheel. That is how I understand it Kern. I'm no expert but the feel of hydraulics is completely different. Sandra's Scott hybrid and my sons' MTBs have hydraulic disc brakes and their 'touch' is superb. It may well be that good quality cable disc brakes perform very well and much better than rim brakes. All I know is that my cable disc brakes were bottom-end, heavy, clunky, and worse than a decent V-brake. They also had a single piston that pushed the rotor sideways against the opposing (static) pad. Opposing pistons squeezing the rotor is better and should need much less adjustment (if any). With eleven bikes there's no more room. Two bikes is enough for me Chris, once the hybrid is up to scratch. If I won the lottery I'd buy a Trek Superfly Elite but that doesn't look very likely (will keep trying though). Hilary wrote: hydraulics are a complete mystery to me! Basically, cable brakes pull wire and hydraulics push fluid. I might know more in a couple of years! It might be worth doing a trial bleed before things get gungey, corroded or whatever. Doubtless you won't let your bike get into the pitiful state of Katie, my old Land Rover. Is there some kind of maintenance schedule for changing seals? Or maybe they last forever! The seals don't get much of a mention on Disc brake FAQ. I assume they are not something to bother about. I've had cantis, side-pull, V-Brakes, Magura hydraulic rim brakes with racing levers, Magura hydraulic rim brakes with MTB style levers and Juicy 3 hydraulic disc brakes which I still have on one of my MTBs. I've never had to service the hydraulic rim Magura brakes in about 12 years on the mtb, apart from replacing the blocks. Never even had to bleed them, though they do wear the rim. Similarly on the touring bike with drop Magura levers. Never had to bleed them. The Juicy's had to have a seal replaced as there was a leak. I got the shop to do it. I agree with Patrick that the hydraulic disk brakes are special. Fantastic sensitivity, power, modulation. However the leaking seal made me a little wary of them for touring. To replace the pads you have to force the cylinders apart in the Juicy's. Easy to do. On my current tourer I have a different setup. V-brakes with Swissstop blue pads and Rigida Andra rims. These are tungsten-impregnated rims and with these Special pads give phenomenal longevity. I've done 10000 miles on the bike and the pads aren't fully worn yet and the rims show no appreciable wear. They say this type of rim lasts as long as 6 normal rims. For touring this is probably preferable to the hydraulic disks, but only for that.